Have you ever read the text in between the recipes in a cookbook and wished you could have sat down and shared the meals described? That's what happened when I read "Who Wants Seconds: Sociable Suppers for Vegans, Omnivores & Everyone In Between," the new cookbook by Echo Park's Jennie Cook, who runs Jennie Cooks Catering in Los Angeles. It's not a slick, commercial kind of cookbook but instead a collection of favorites collected and tested on groups over the years. With colorful, hand-drawn illustrations and lots of stories about Jennie's upbringing in the country, her life of feeding people and family vacations, it's a very personal and accessible collection of dishes from Sunshine Ginger Soup to Kale Waldorf. I lived in Jennie's HaFo SaFo neighborhood when I first had kids and then our kids both went to Hilltop Nursery School, so I've tasted her famous green beans with chile pecans many times. 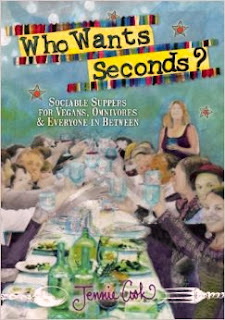 "Who Wants Seconds" puts an emphasis on vegetables, since part of Cook's catering business is called Plant-Based Parties and she's deeply involved with the gardens-in-schools movement. But there's also perfect roast chicken and barbecue brisket, some dishes drawn from her Pennsylvania Dutch heritage and other recipes that are favorites of her large California extended family. Jennie's book had an unusual effect on me: I wanted to make the pickled cabbage and corn fritters, but I also vowed to host more dinner parties, to get together with friends and relatives more often, to connect better. Jennie Cooks catered my wedding and the food was wonderful!! Love them!